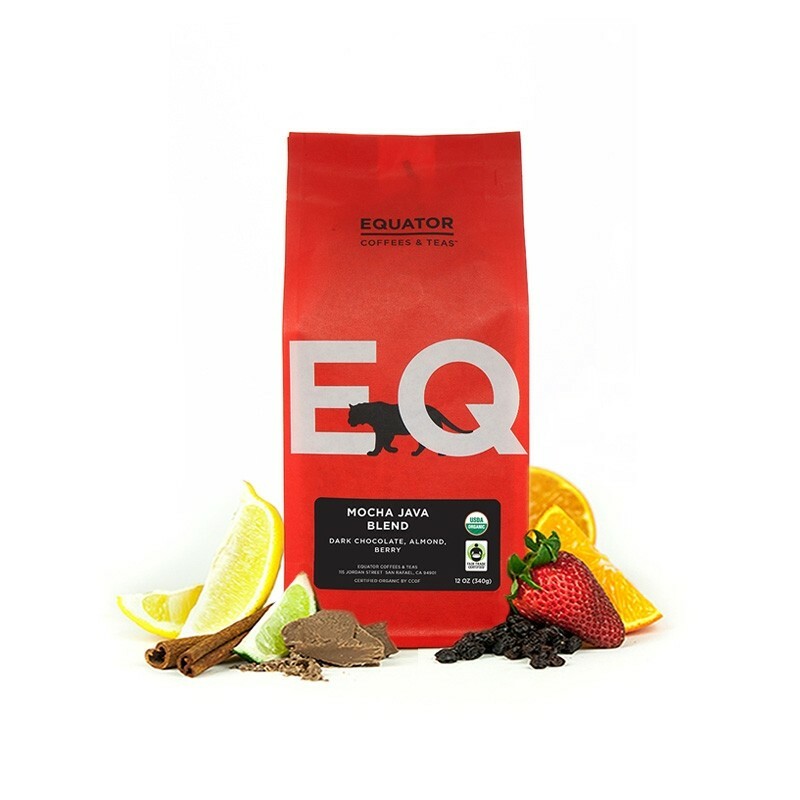 The Mocha Java Fair Trade Organic was carefully roasted for you by Equator Coffees & Teas. The Mocha Java blend name comes from two of the original ports where coffee was traded: the port of Mocha and the port of Java. This coffee is completely comprised of certified Fair Trade and Organic coffees from Sumatra for notes of dark chocolate and Ethiopia for berry-like fruit flavors, combined with a bright-toned Latin American coffee to provide balance and smoothness. Hard to get it to not be too strong in my Bunn drip. Had good brews and bad. Nice tasting coffee, smooth pour but lacking depth of flavour. Drank as espresso and strong flat white. Wild roller coaster. Deepish upfront then crazy berry / acid finish. Awesome notes of dark chocolate. Great as a mach as well as cap. Really enjoyed this one! Love this coffee. A lot of different flavors come through using our French press and we've been enjoying the complexity. Really enjoyed this, but maybe a little too fruity for our liking. Good coffee but I didn't enjoy the earthy flavors in it. This is some really nice and mild coffee. You definitely feel the hint of chocolate flavor and the smoothness. Very smooth and nice chocolate flavor that wasn't too strong. Great coffee! Maybe the best I've had! Picked this one up while away on a trip, I am enjoying this Equator Mocha Java blend. I can definitely taste a medium bitterness and the dark chocolate tones. I find the fruity, berry like tones come out more as the coffee cools. Overall, I like this coffee. I have only made this as an Americano using my DELonghi espresso machine. I thought it was average for Aeropress espresso, but my wife liked it the best ever for her latte. One of the best I've had so far. I want to make it my daily drinker. Top notch for my palate. Earthy and rich, not too bright. I liked the flavor of this coffee very much. Very smooth, however a bit too light for my tastes. I had ordered a lighter blend hoping my wife would enjoy it; but no so much. However you sent me pretty much how I requested it. Liked it. Really got the rich flavor profiles like chocolate and some subtle fruit notes that were berry-like. Very smooth finish.It was more predominately on the earthy side (mostly chocolate). I'd like to try some more coffees that are more predominately on the fruity side, juicy with subtle chocolate notes. This one came across as an enigma to me. When I saw the Mocha Java, I was stoked, I figured it was a flavored coffee which is always a treat. It is NOT. It is coffee with chocolate notes which means the name is a little bit misleading. That being said it is a good quality, solid cup of coffee. Definitely something I would proudly serve my company in addition to enjoying my self. I LOVE fair trade. Love it. It is amazing how little these farmers often make, and that they can support their family due to fair trade, worth a few extra bucks in my opinion! The chocolate comes through on this one. Very mild berry flavors if at all. On the darker roasted side. After having a few cups over a period of time it does taste a little on the burnt side. It was great. Some nutty and chocolate notes in there too. Roasted just three days before I got it, which is pretty cool.